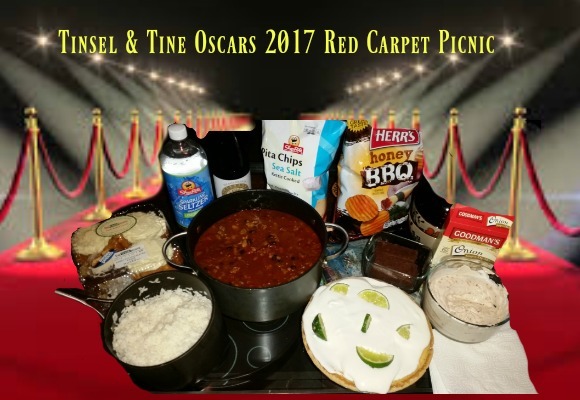 I normally start these round ups talking about the foods served at my annual Red Carpet Picnic, then I go into the host, handled very well by Jimmy Kimmel, whose Trump Administration political jokes were funny, made a point, but weren't too over the top - "The Oscars are being watched by 225 countries around the world who now hate us". Then I normally go to the red carpet fashion trends & best and worst dressed, followed by best speech and so on... highlighting various categories, some fodder, and ending with the highest honor of the evening Best Picture, but of course this year, we have to start at the end and work backwards. Was this the craziest thing ever to watch before your eyes!?! The wrong winner being announced - LA LA LAND on stage for over 2 mins of acceptance speeches when a flurry of activities starts to happen on stage, next thing you know, one of the producers of La La Land is telling MOONLIGHT to come up on stage because their movie is the actual best picture winner! Of course, we had a similar instance at the Miss Universe Pageant 2015, when Steve Harvey announced the wrong winner and they had to un-crown, the newly crowned Miss Colombia Ariadna Gutiérrez, because the actual winner was Miss Philippines Pia Wurtzbach. 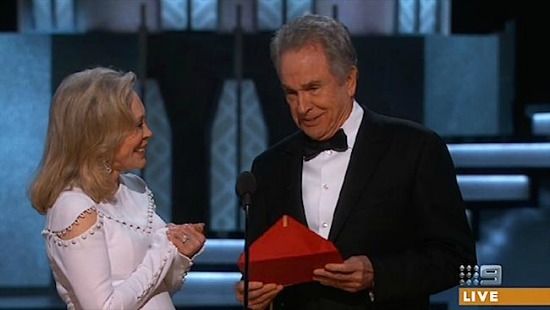 Even though this Oscars #envelopegate turned out to be an error on the part of PriceWaterhouse, and it was Faye Dunaway who actually announce the wrong winner, I still blame Warren Beatty's befuddlement. He should have been able to think on his feet a little better, when he saw he had the wrong envelope he should have just said so, and made some little joke about drawing out the anticipation a little longer. It still would have been a big snafu and the stage manager would have had to run out to deliver the correct envelope, but it wouldn't have been the frenzy that ensued. 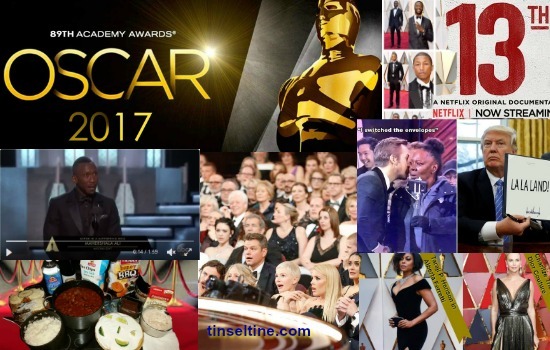 This is a great breakdown of #Oscars #Envelopegate or 2017 Best Pic Screw up or #BeattyBefuddlement! The only other time this happened at the Oscars was Sammy Davis Jr, in 1964 Best Music Score that year - He read "John Addison for 'Tom Jones.' which wasn't even nominated. The correct envelope was quickly brought out which was actually André Previn for "Irma La Douce. 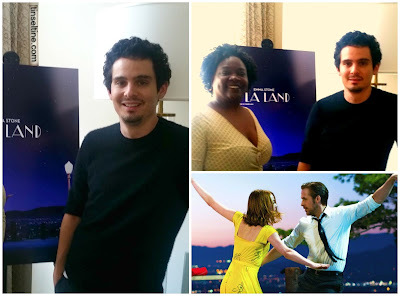 Anyway, good for Barry Jenkins and everyone involved with Moonlight, it wasn't my favorite movie, it's Oscarworthy, but the film never really resonated with me per se; however, I thought it had a good chance of winning if Jenkins won for Best Director, when he didn't, I did think La La Land would win. 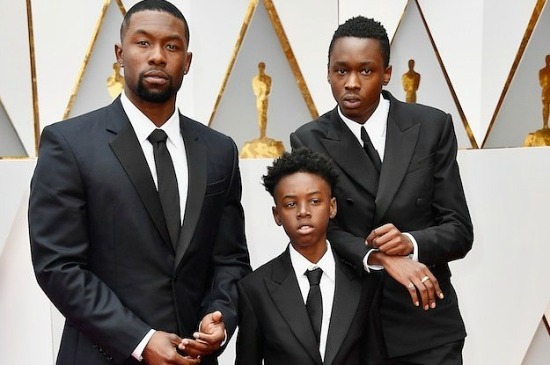 The movie's main character Chiron is played by 3 actors during the film at different ages, and I loved that all 3 walked the red carpet together: Alex Hibbert, Ashton Sanders & Trevante Rhodes. I also predicted Mahershala Ali to win Best Supporting Actor, he's been around for a long time, but now people can finally put a name to the face and pronounce the name. Making him the first Muslim actor to win an Oscar. And on that note, let's acknowledge the two Oscar Winners who were not present to receive their Oscars due to President Trump's Executive Order banning people from seven majority-Muslim countries from entering the United States - Asghar Farhadi Best Foreign Language Film The Salesman (second Oscar, also won in 2012 for "Separation") did not come as a protest. And Syrian cinematographer Khaled Khatib, whose film White Helmets, won for Best Documentary Short was unable to attend after being barred from entering the US despite being granted a visa. Which brings us to the fact that the Oscars were a far cry more diverse than last year. LA Times: We'll never know how the votes broke down, but do you think the steps that the academy took last year to invite its largest, most diverse class ever has somehow turned the tide, or could this year ultimately just be a kind of one-off? April Reign: I think it remains to be seen. I think the influx of 683 invitees was helpful for everyone, both those who were already members and for new members, to say, “Let’s look at this process and make sure that we’re doing the very best that we can.” But it’s very important to me that we make sure to say that the wins that happened last night were not because of #OscarsSoWhite. Viola Davis deserves every award ever, in every category. Mahershala Ali’s gripping, haunting performance was the best that I saw last year, so he was fully deserving. And all of the movies that were nominated and won were in production or pre-production for years before January 2015 when I created the hashtag. And of course my pic for Best Speech of the Night is Viola Davis, Best Supporting Actress Winner for FENCES. Davis is the first black actress to achieve Oscar, Tony, Emmy with acting awards — Whoopi Goldberg is an EGOT winner, but her Tony is for producing. This leads us back to my Oscars Red Carpet Picnic - Every year I say I'm going to reach out to a restaurant or food company (like DiBruno Bros.) ahead of the Oscars, and ask them to be my #OscarsRedCarpetPicnic Sponsor. They provide the picnic and in turn I give them a lot of promotion leading up to the Oscars, during and after; but I never do it. I chicken out cause it's hard for me to make an ask, or I wait too long and realize I don't have enough time to set it all in motion. So as usual, I wind up buying and making it myself, but I also don't start early enough in the day preparing. I want it all laid out for us, and photo shoot done by 5pm, so I can watch the red carpet and eat in peace, but as usual, I was running late. What I am happy about is my Turkey 3 Bean Chili was so good! The best chili I think I've ever made, not that I cook all that much. Remember, I am an eating out food blogger, not a kitchen blogger. Still, the reason I made the Key Lime Pie was to practice, as I've been invited to compete in THE PHILLY INFLUENCERS FLORIDA KEYS & KEY WEST COOK-OFF #FLKeysCookOff on March 6th at The Restaurant School at Walnut Hill College. The Winner that makes the best KeyLime Pie with their own secret ingredient, wins a trip to The Florida Keys! and I NEED A VACATION!!! Sorry, can't reveal my secret ingredient yet. Were there mosquitoes on the red carpet that went for the throat? Because many showed up in high collar dresses, some Victorian era, others just all covered up! Some wore Blue ACLU ribbons in support of civil liberties. 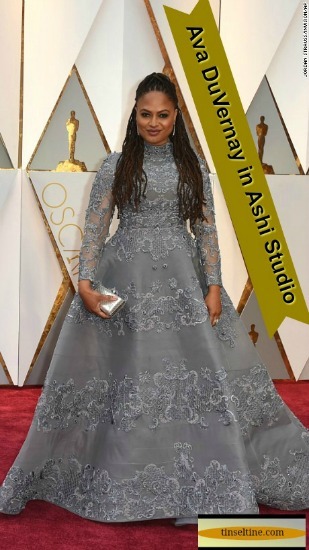 Ava DuVernay decided to chose a dress by Ashi Studio, a Lebanense brand, based in Beirut. I really liked Brie Larson's gown, she would have been a runner up. 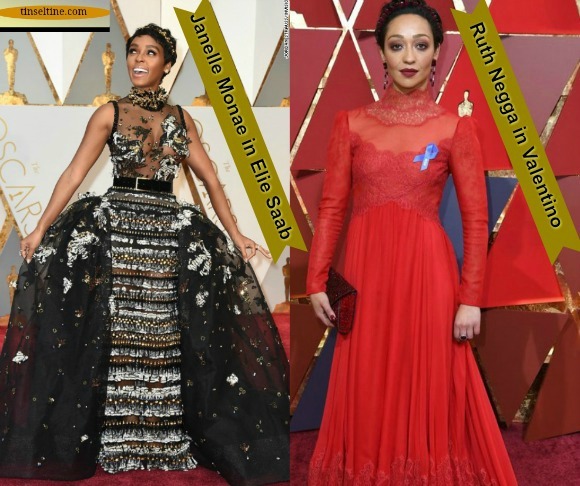 But my choices for Best Oscars Red Carpet Looks were Taraji P. Henson, Charlize Theron (2 years in a row) and the it girl of the night Academy Award winner Emma Stone. The candy parachutes were a great touch. And I really liked the montages of presenters watching a favorite movie of a fellow presenter. 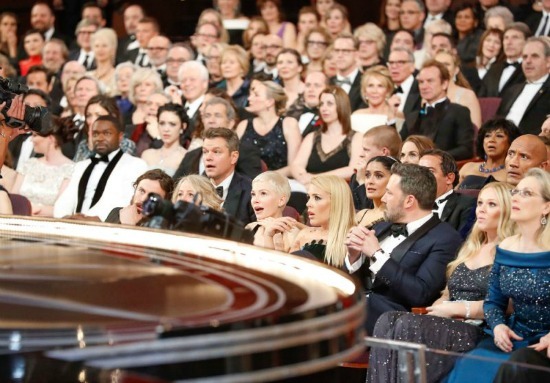 The Hollywood Tour people who were unexpectedly ushered into the middle of the Oscars Broadcast was inspired #GaryfromChicago, but I think the celebrities were more shocked than the real people, especially the stars on the front row. In Memorandum is always one of my favorite parts of the evening Sarah Bareilles sung Joni Michell's "Both Sides Now" ending with Carrie Fisher sending "May the force be with you". Click HERE for a list of all the Winners. CONGRATULATIONS!